Guests of the Foy family’s British-themed poker tournament dressed as ‘Fish and Chips’. Proceeds from the tournament were donated to the Foundation. atteo Cavalca, the second son of Tatiana and Roger Cavalca, was born on December 9, 2002, in Vancouver, BC. Early exams revealed that Matteo had fused kidneys. This condition did not slow him down and he went on to grow into an active and vibrant young boy. In 2014, Matteo fell at a Junior Youth evening. Life for his family was about to drastically change. Two days later, he began throwing up. Diagnoses from a physician was that he had the stomach flu, but he did not get better with time. After many trips to the hospital, a CT scan and three ultrasounds, it was revealed that Matteo had a stage 3 Wilms tumour in his kidney. He would go through his cancer treatment with the support from his family and community. In February 2015, doctors determined that depending on the size of his cancerous tumour, they may need to remove his whole kidney. Matteo’s fused kidneys meant that he would need a kidney transplant to survive. His medical team did everything they could, but it soon became apparent that he would need a transplant. 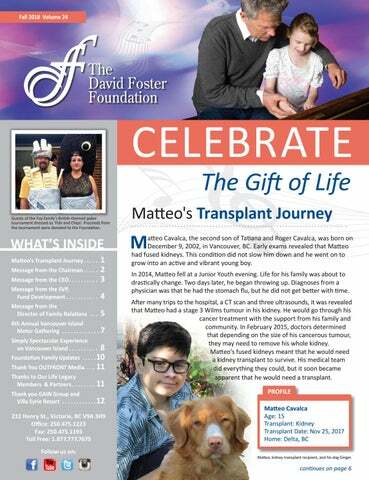 PROFILE Matteo Cavalca Age: 15 Transplant: Kidney Transplant Date: Nov 25, 2017 Home: Delta, BC Matteo, kidney transplant recipient, and his dog Ginger. ne of the highlights of my summer was coming back to Victoria, my home town, to visit with my family and to enjoy one of the most beautiful places in the world with dear friends and some of our dedicated donors of the Foundation. David Foster with 12-year-old kidney transplant recipient, Rahmat and his family. Mike Ravenhill and daughter Amanda during Simply Spectacular Experience on Vancouver Island event. continued from page 1 appointments with specialists, pharmacokinetic testing, and kidney biopsies kept the family busy. Surgery to repair the tear in Matteo’s ureter would take longer than normal because his abdominal cavity was full of scar tissue from the numerous abdominal surgeries and radiation therapy he had already been through. Returning home after the long-anticipated surgery to repair his ureter, Matteo’s family finally felt they could breathe easier. “I also have to confess that now that we are breathing again, I feel so tired… it’s like I have been carrying a ton of rocks for 3.5 years and I can finally rest. So we have been taking the time, as a family, to rest,” Matteo’s mother writes on March 22, 2018. Matteo at BC Children’s Hospital. Matteo’s mother began testing to see if she could be a living donor. Several members of his family were perfect matches, however, doctors found small health issues that were non-life threatening but would diminish the kidney’s life expectancy once transplanted into Matteo. This summer, the family balanced work, appointments, fun and rest, making up for time lost during Matteo's stay in hospital. He has regained his strength and playful spirit with support from his family, friends, teachers, peers and medical teams. On November 23, 2017, Matteo’s family received a call that a kidney was available from a deceased donor—a perfect match. On November 24, Matteo underwent his transplant. Surgery was complete by 4am, November 25, Matteo’s Grandpa’s birthday! This day would now be even more special to his family as it celebrates his grandfather and Matteo's second chance at life. Matteo has received excellent reports during his followups and he began grade 10 in September. He will be on immune-supressing medications for the rest of his life in order to keep his kidney, but the challenges are worth the ultimate gift that he has been given. His parents were grateful for the Gift of Life their son was given, but feared complications in his recovery. Matteo showed signs of a lung collapse and a cystogram revealed a tear in his bladder. However, a biopsy of the new kidney confirmed no signs of rejection. Matteo’s family is beyond grateful for his donor and the family that made his transplant possible; the medical teams that became friends; the friends that became family; the Foundation and the community from around the world who offered support and prayer for them during the most difficult time of their lives. Matteo with his parents, Tatiana and Roger, brother Bruno, and dog Ginger. n Sunday, August 26, the David Foster Foundation was honoured to be a part of the 6th Annual Vancouver Island Motor Gathering for the fourth consecutive year. Since 2015, the Foundation’s partnership with the GAIN Group has raised muchneeded funds for families with children going through the organ transplant process. Over 7,500 enthusiastic spectators attended the event. Surpassing last year's totals, this year the Motor Gathering raised $186,218 in cash donations for the David Foster Foundation, the Cowichan District Hospital Foundation, and families within the Cowichan Valley. Over a hundred sponsors participated in the event to contribute to its great success. Thank you to the GAIN Group for creating a fun-filled day on the track, as well as an opportunity for people within the community to come together in support of others. People of all ages admired over 400 classic, unique, modern, and custom cars and motorcycles displayed at the track. It was an honour to share our message about the importance of organ donation with over 7,500 spectators. The DFF team was thrilled to talk to people who were inspired to register their consent for organ donation because of the information that was shared with them that day. This is truly invaluable! We were so grateful for the opportunity to engage with those in attendance. Evanne, two-time heart recipient, and her brother Bauer spoke with attendees about organ donation and shared Evanne’s story. The $100,000 donated to the David Foster Foundation from the Motor Gathering will make a positive difference in the lives of families and children going through the organ transplant process. Thank you for showing them that they are never alone. The strength of our communities is inspiring! We look forward to seeing everyone next year on August 25, 2019! David Foster Foundation and Cowichan District Hospital Foundation were the grateful benefactors of the event. rom July 30 to August 2, 2018, generous donors from across North America gathered on Vancouver Island to attend the David Foster Foundation Simply Spectacular Experience on Vancouver Island event presented by the Villa Eryie Resort and the GAIN Group. The goal of the event was to raise one million dollars to support the increase in the number of families requiring financial assistance during their children’s transplant journeys. Thanks to the generosity of our donors, we surpassed this goal and raised over two million dollars! The support provided to these families will be invaluable. The GAIN Group has been a partner of the David Foster Foundation since 2015. Through this partnership, the GAIN Group has demonstrated a remarkable dedication to the Foundation and a passion for our cause, families and children. It was this shared passion and commitment that blended the picturesque beauty of Vancouver Island, world-class entertainment, and exceptional hospitality to create an intimate fundraising event at the stunning Villa Eyrie Resort. “When great people come together, miracles happen!” declared David Foster. Guests arrived at the Villa Eyrie Resort, overlooking the breathtaking views of the Saanich Inlet, for a magical four days in the beauty of the wild west coast. Brian McKnight, Angelica Hale, Melissa Peterman, Pia Toscano, Sheléa Frazier, and Fernando Varela all joined 16-time Grammy Award Winner David Foster on stage to share in two very special performances. It is heart-warming to see so many people come together to make a positive difference in the lives of others. “It would not be possible to do the work that we do without the tireless dedication of hundreds of volunteers who give their time to our Foundation because they recognize the importance of keeping children and their families together,” noted Michael Ravenhill, Chief Executive Officer. Alongside the GAIN Group and the Villa Eyrie Resort, several individuals and organizations went above and beyond to ensure the event was a dazzling success, including local tour companies, sponsorships from local vendors, and a special dinner at Government House hosted by Her Honour, the Honourable Janet Austin, Lieutenant Governor of British Columbia. We were honoured to offer several unique and special auction packages to our guests, thanks to the generosity of our auction donors: Prestige Hotels & Resorts, for a Luxury West Coast Vacation at the Prestige Oceanfront Resort; Sylvester Chuang and Peter Trzewik, for a Luxury West Coast Vacation at Cowichan River Outdoor & Fishing Lodge; Magnus Lewin and Edith Carvalho of TradeWinds, for the TradeWinds Aqua Terra Experience on Mayreau Island; Margot Micallef, for a Retreat at Firlands Ranch, combined with Panorama Resort; George and Sherry Schluessel, for A Log Castle Culinary Retreat in Big White at the White Spirit Lodge; and David Knight for his donation of a 1957 Mercedes-Benz 220 S Cabriolet. Thank you to everyone who made the event a success and allowing us to create more tomorrows for children today. From our presenting sponsors Villa Eyrie Resort and the GAIN Group, Peter Trzewik, Chief Operating Officer and Dr. Sylvester Chuang, Chief Executive Officer. Life Legacy Members Jim and Sandi Treliving with Her Honour, the Honourable Janet Austin, Lieutenant Governor of British Columbia, and David Foster. Guests enjoy the view during cocktails on the All White with a Splash of Purple evening. Proud supporter, Joan Waechter and her nephew Wes Schild with Dr. Sylvester Chuang. Generous supporter Walter Scott and his guest Cindy Smith. David Foster with long-time supporters Richard Stephenson and Dr. Stacie Stephenson. Guests in their British-themed costumes for the Foy family annual Poker Tournament. Isla enjoying fall in Nova Scotia. hoenix Borrowman was born on April 8, 2009. After suffering cardiac arrest on three occasions, Phoenix received a life-saving heart transplant on August 14, 2009. The Foundation provided financial assistance to the family throughout their transplant journey so that they could focus on caring for Phoenix. This September, Phoenix started grade 4 and is the tallest in her class. She loves to work on art projects and write graphic novels. Last year, she enjoyed a very special American Thanksgiving at the home of her donor family in Miami. 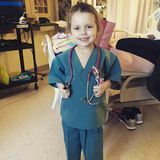 This year, on August 15, one day after Phoenix’s ninth heart day anniversary, Phoenix’s ten-year-old cousin, Madelyn Foy, inspired family and friends to come together to fundraise for the David Foster Foundation. The Foy family hosted their annual poker tournament to benefit the Foundation. The event was “British Invasion” themed and guests’ costumes ranged from Harry Potter to Boy George to Fish and Chips. The event raised funds with the buy in, people re-buying in, and with a raffle to sit at the VIP table (the coveted seats came with full service – a menu of drinks and food, and even shoulder rubs). During the event, the Foy family shared information about the importance of organ donation and had organ donor registry forms to encourage everyone to sign up. Family and friends had a great night, and the event raised $1,000 for the Foundation. THANK YOU to our generous presenting partners for helping us raise over 2 MILLION DOLLARS in support of Canadian families with children needing life-saving organ transplants.